Doctor Who closes off the current season with an abundance of Cybermen and two versions of the Master to challenge the Doctor. The previous episode was a tough act to follow in terms of what it promised. Bringing back the Mondassian Cybermen, doubling up on versions of the Master and teasing a Regeneration bring with them lofty expectations that will be difficult to meet. Having a lot of ground to cover in a finale is nothing new certainly in this show and especially for Steven Moffat but this episode surprises by keeping the core narrative relatively simple. It isn’t about a Cyberman Invasion or the Doctor dealing with his greatest enemy doubled, it’s about protecting people and the Doctor staying true to himself. In this case, simple is always better. The episode picks up with the Master and Missy holding the Doctor prisoner and threatening to show him a new kind of death. In many ways this could easily have been the entire episode and it might have been fine that way. I could almost see an episode where we learn how the Master has changed through his/her regenerations as the Doctor figures out a way to stop them and that might have been interesting on its own. The problem with that is that it’s completely expected and I think the episode mines it for what its worth. John Simm and Michelle Gomez are delightful to watch together. There’s an underlying hint that they are the same person but the performances celebrate their differences rather than focusing on what makes them similar. As such it feels like an unlikely pairing with some level of familiarity to that. John Simm is noteworthy as he could so easily have played the character like an over the top Saturday morning cartoon villain but there’s plenty of nuance to his performance suggesting more depth than is given by how he is characterised. Amusingly, two versions of the Master aren’t enough to outsmart the Doctor who has already figured a way out of the situation as they obliviously gloat. 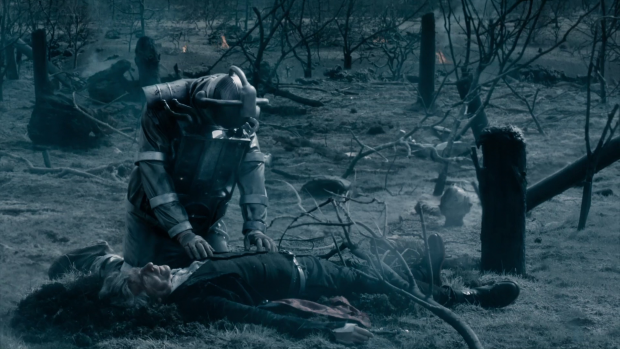 Of course the Doctor had engineered a way for the Cybermen to zero in on lifeforms with two hearts which changes the Master’s plan to one of self preservation. Peter Capaldi is excellent in this scene as the Doctor shows no fear when at the mercy of Missy and the Master together. It’s somewhat predictable that he would have already planned a way out of it and I was reminded of “The Family of Blood” in the way that he carried out his plan. There are other references as well such as the scarecrows and defending a stronghold with apparently crude weapons. I’ve spent a long time talking about this relatively short scene despite the fact that it’s not overly significant in the grand scheme of things. It’s one of the few examples of Missy and the Master having meaningful interactions in this episode which I find strange as I would never have imagined an episode with multiple versions of the Master to have them as a window dressing. Not that this is a bad idea. If there had been more scenes of them together it would probably have been far more irritating. Over the top theatricality is all well and good but in abundance it can grate after a while. What we got of Missy and the Master was definitely enough as their relationship was fairly one note. There is a ham fisted explanation for why Missy can’t remember the Master meeting her and it’s fine though would have made no difference if it had been ignored completely. Doctor Who has never been good at delivering logical explanations for the madness that goes on to make stories happen so there was really no need in this instance. This is especially true when the episode contradicts this by having Missy remember a lady giving her advice at some point. 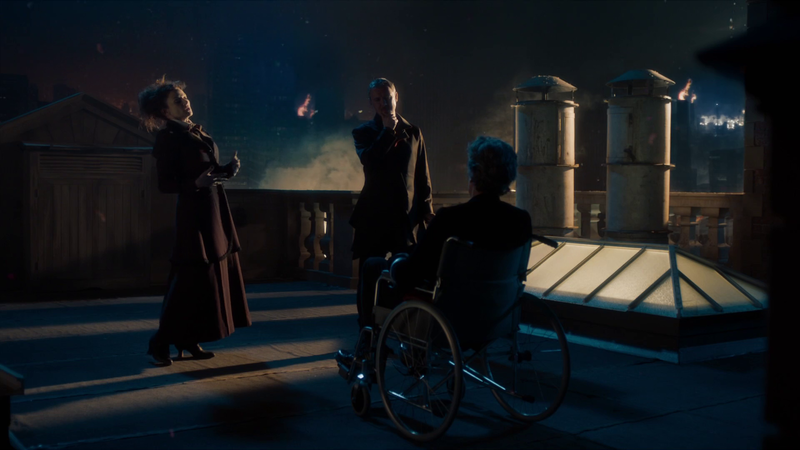 Missy and the Master being dispatched at the same time by each other was a really nice touch. Missy stabbing him so that he can become her makes so much sense and the Master killing her while preventing her from regenerating because he doesn’t want to become her is exactly what I expect from him. They have a mutual hatred and admiration for one another so it’s wonderfully poetic that they would kill each other. It’s almost suicide but not quite. There’s also the handy hint that there is a regeneration between the Master and Missy to leave the door open for the Master to return in some form. Of course there’s every possibility that Missy isn’t gone for good but at least the interim regeneration is a possibility. Despite how good this is, there is a lot of potential in this story that the episode doesn’t take advantage of. Missy’s attempt to reform has been significant over the second half of the season so there is no pay off to this. The question over whether she has actually reformed or has any appetite to is never quite answered. Knocking out the Master to help the Doctor is entirely self serving as is pretty much everything else she does in this episode so we will never know if she had the potential to truly change her ways. On that same token there is a distinct lack of the Master being ashamed of what he will become and Missy hating what she once was. This is the underlying motivation behind them mutually killing one another but the episode doesn’t play with this as much as it could have. I understand the reasoning behind keeping’s motivations ambiguous to manufacture tension but it comes at the expense of interesting storytelling. I did like the suggestion that Missy isn’t even sure if she is genuinely on the Doctor’s side at this point as she points out when she is asked. She does tell the Master that it’s time to stand with the Doctor rather than against him but this could be another example of her behaving in a self serving way. Sometimes ambiguity does have to give way to clarity especially when closing off a character. The Cybermen are similarly robbed of any nuance despite the motivation for undergoing conversion seeming reasonable in the previous episode. None of that comes up here other than the Doctor explaining why they would change themselves so profoundly. It’s information we already have and doesn’t really add anything. The role of the Cybermen in this episode is to simply be an antagonistic force that needs to be overcome. They exist to have things to fight against but as enemies they are really underwhelming because there’s nothing about them that’s overly threatening other than their numbers. They also seem very easily thwarted. None of this really matters because this is all a test for the Doctor. It’s a test of his character and his ability to protect people. How he juggles everything that he needs to juggle is the real core of this episode and this works brilliantly. His speech to Missy and the Master where he explains why he does what he does is one of Capaldi’s best and highlights the major difference between the Master and the Doctor. The Master thinks in competitive terms; who will win and who will lose. It’s a very binary outlook but the Doctor doesn’t see life like that. He is just trying to do what is right while being kind. It’s important to him and makes for another “The Family of Blood” reference. 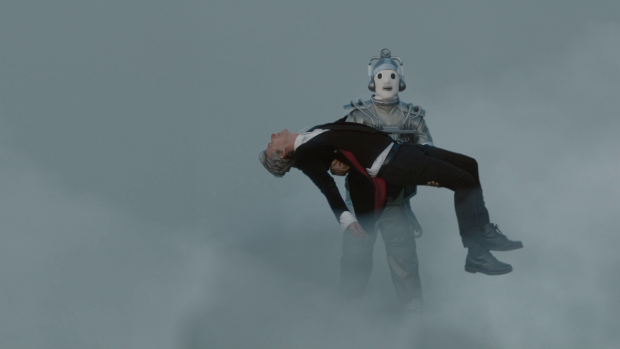 The teased regeneration continues to be teased throughout the episode when he is shown to be holding it back before finally stopping himself at the very end. He repeats the David Tennant line “I don’t want to go” as well as paraphrasing the Matt Smith line about being the Doctor. Both of those come at the very end of those versions of the character which is definitely no accident considering Capaldi’s end as the Doctor is very near. Resisting regeneration is something that the David Tennant version did because he was comfortable in his own skin. Matt Smith’s version was more accepting of the change because he had lived a long life and was eager for the rebirth. This version has gotten to the point where he knows who he is and thinks he has a lot to give to the universe so wants to remain as he is. He points out that he never wants to change again because he feels that he is the Doctor and wants to stay as he is. He’s tired of becoming someone else so fights to hold onto himself. The end reveal that the TARDIS has taken him back to the time of William Hartnell’s Doctor’s regeneration is interesting as it brings him full circle in a way. Comparisons to the Willam Hartnell version have been made here and there since Capaldi took over the role which is also definitely not an accident. It looks like the William Hartnell’s version -played here by David Bradley who played William Hartnell in An Adventure in Space and Time– is going through a similar personal crisis that involves resisting regeneration. Perhaps the Christmas special will involve both of them finding a way to accept the change. If so then the episode becomes more about rebirth rather than death which is definitely a better idea. Bill’s role in the episode is brilliantly handled. Having her as a Cyberman throughout but still having Pearl Mackie do the scenes while periodically substituting her for a Cyberman to remind the audience that she has been converted works really well. It also builds a fascinating theme of identity for her as she struggles to accept her change in a similar way to the Doctor at the end of the episode. She thinks of herself as human so we see Bill as a human throughout the episode. It also constantly reminds us of the tragedy surrounding her. The Bill that we knew throughout the season is gone because she has 10 years of experiences that we really haven’t seen. I wish the episode had done more with the fact that the Master might actually know her better than the Doctor does but there’s too much going on for that to be a focus. There is the point where he teases her but I feel that he would have done that anyway. Do you believe I’m real yet? The return of Heather, as seen in the season opener “The Pilot” was a nice surprise that I was unable to predict because I had missed the reference to the tears not belonging to Bill. In a sense Heather has always been there waiting for the point where she can be useful and this is that time. 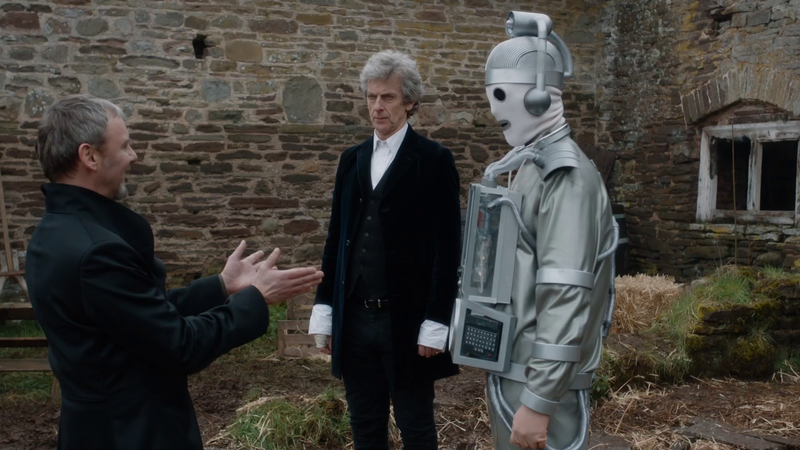 I liked this because it allows Bill becoming a Cyberman to be something that still happened. What Bill was is essentially gone and now she’s something else. It is established that she can go back to being human if she wants but Heather also promises so much more to life and the universe in her current state. This allows Bill to essentially graduate as the Doctor’s student and pass on what she has learned to someone else. She goes from Heather showing her that there’s more to life to promising to be a guide to Heather. It’s a quick reversal and it works well. Where this falls down is that it’s thematically very close to Clara’s exit last season. She too became something else and decided to travel the universe without the Doctor. The similarities are far too clear to be ignored and the familiarity weakens this ending somewhat. Bill remains a character with a lot of potential that hasn’t really been explored as well so I really hope to see her come back to resolve her story at some point. This episode provides an ending of sorts for Nardole who is shown to challenge the Doctor right to the end. Part of the appeal of this character is that his knowledge is somewhat comparable the Doctor which gives him suitable grounds to offer a challenge. In this case he doesn’t listen to the Doctor when he lies about remotely blowing up the area and killing Cybermen. He has frequently been able to call the Doctor out on his lies and it’s great that one of his final scenes allows him to do so. He also mentions that the best version of himself is when he’s with the Doctor continuing the theme of the Doctor inspiring people to be their best. It’s a dignified parting of the ways and closes off Nardole nicely assuming this is the last we’ll see of him. As finales go this wasn’t entirely successful but it had the right stuff where it counts. Having the big plot elements be a backdrop to more grounded emotional stories was the best decision and the episode allowed for some excellent performances. Much of the potential isn’t fully realised such as having two versions of the Master and continuing the idea of a desperate people being open to the idea of Cyber conversion but there was merit to many of these ideas that survived the big finale. Bill and Nardole were allowed dignified exits though Bill’s is thematically very close to the way Clara left the show which lessens the power of it somewhat. Nardole is still allowed to be someone who can challenge the Doctor so it’s good to see him leave while doing that. 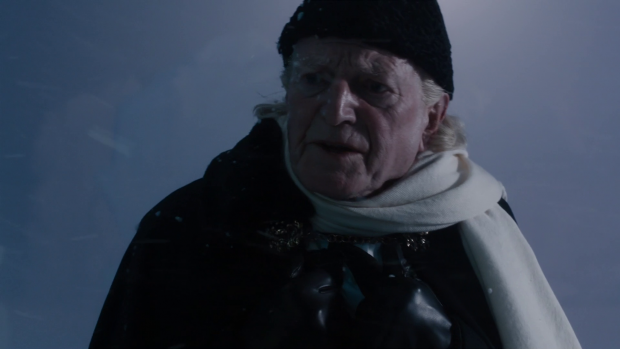 The regeneration tease is yet to pay off but going back to the point of the regeneration of the first Doctor creates an interesting scenario for Christmas.